Every face is unique and so is every nose. Visually, it is the centerpiece of the face and functionally, it plays an important role. 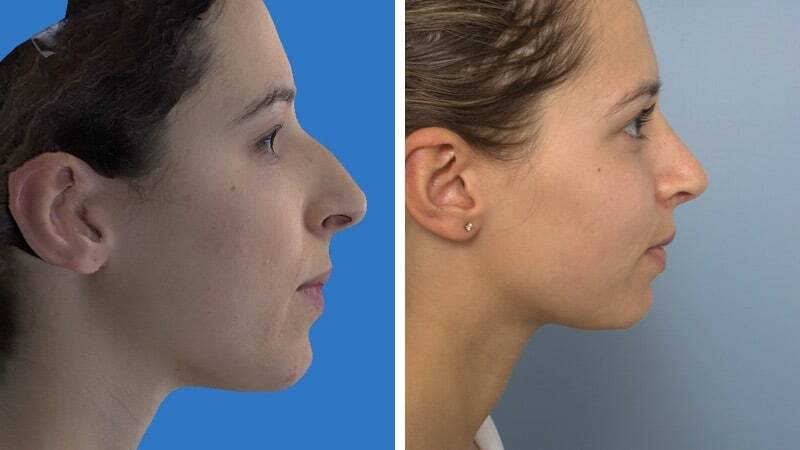 Many people are unhappy with the appearance of their nose, its effectiveness for breathing, or both. The problems may stem from an injury or another condition. It may also be hereditary. It’s important to realise that some anatomical characteristics of the nose can be changed, but others can’t. By assessing the nose in relation to the other facial features, we can plan specific modifications to improve its appearance and/or function. During your consultation, we will discuss which nasal features you like and dislike and what type of changes may be possible. Good communication, adequate information and a clear surgical plan are essential for a good outcome. During the consultation I may show you visual aids to help you understand the procedure and the result that’s likely to be achieved, including anatomic diagrams, intraoperative pictures, and computer imaging. You should also bring in pictures of noses you find appealing. I also use the Vectra 3D imaging system, which uses sophisticated software to make virtual changes to the appearance of your nose and model a new shape. This ensures that we are all working to the same outcome. 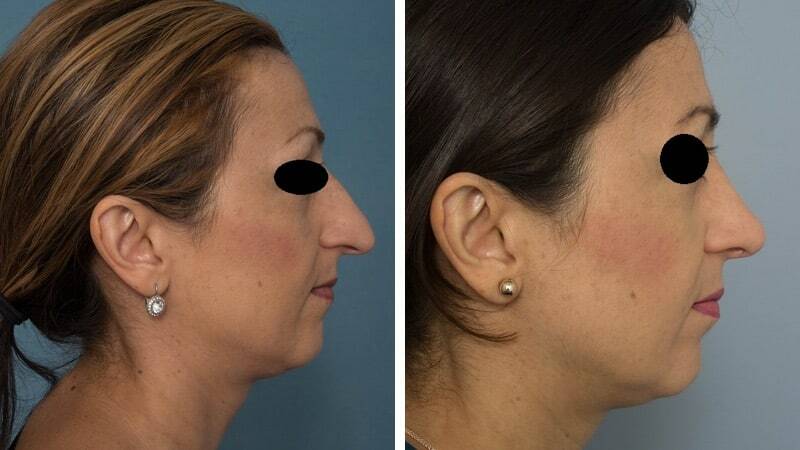 Rhinoplasty is an exacting procedure and its success depends on a number of factors. Quite reasonably, the greatest fear patients have of rhinoplasty is getting a poor outcome. As a patient you should expect me to be very honest with you about the surgical plan, and pitfalls I see in your anatomy, and for me to provide guidance as to what you can reasonably expect of me in delivering a result we agree has met our goals. As a surgeon, I expect of you that you remain realistic about the surgical plan that we make for you together. You can only have the best nose you can have. While the surgical plan can be carried out with precision, some aspects of rhinoplasty are unpredictable. Expectations must be defined before surgery, and in most cases if reasonable, the goals can be met. A number of factors can adversely affect the shape of the nose. Cartilage may warp and cause asymmetry and this may require improvement. If asymmetry is present before the operation, it may not be fully correctable. Surgery to the nasal bones may leave small bumps or irregularities once healed. Bleeding, infection or scar contracture can occur. 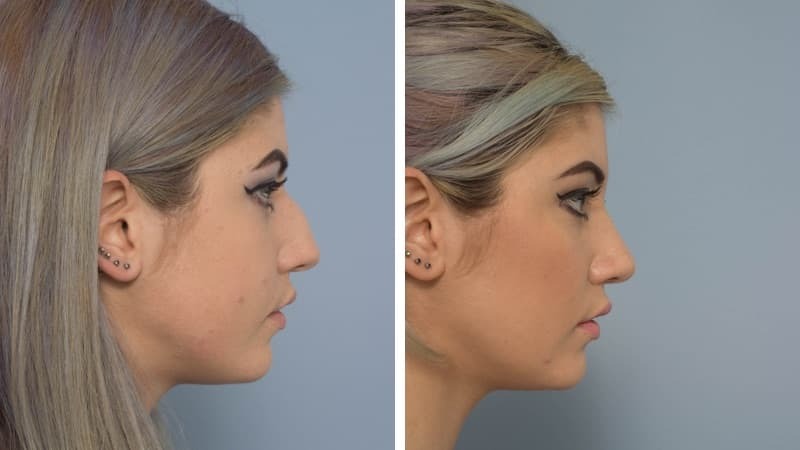 Due to these factors, a small proportion of rhinoplasties I perform require revision, or a second operation, to achieve the best possible result. Medication containing aspirin should be avoided for two weeks before surgery. If you have a history of nasal infections, a nose swab should be done two weeks before surgery. We can do this, or your GP can do it. Rhinoplasty is the surgical procedure used to alter the external appearance of the nose, whereas septoplasty is the most common procedure used to improve internal issues. The septum is the central wall between the nostrils, and is important for nasal support, shape, symmetry and airflow. Rhinoplasty is often, but not always, performed with septoplasty. If the turbinates, or lumps of tissue inside each nostril, are enlarged, turbinate procedures may be used to improve breathing. My approach to surgery is conservative. I will make every effort to achieve your desired outcome, without compromising the support structures of the nose. I perform the majority of rhinoplasties “open”, which means that all shape changes are performed with full visibility. This allows for maximum precision. There are many factors influencing the outcome of a rhinoplasty, and we will discuss these during consultation. They include healing characteristics, the thickness of skin over the nose, how other aspects of facial appearance influence the nasal appearance, the difficulty of correcting asymmetry, and hereditary factors. The nose will look different immediately after surgery. Whilst most of the swelling will disappear within two months, the actual healing process takes a full year, and in some cases even much longer. Some sensation of the nasal skin is reduced, which is of no consequence, but may feel disconcerting for a while. The actual procedure is generally performed under general anaesthetic. Small incisions are made inside the nose, and across the midline strut or columella. The nasal skin is separated from the skeleton, and the shape of the skeleton is then altered using various surgical techniques. The focus is on preserving as much of the tissues that support the nose as possible, while carrying out the agreed surgical plan. Cartilage grafts are often used to improve the shape or the airway. The internal incisions are closed with dissolving stitches. If an incision is made across the columella, non-dissolving stitches are used to close the wound. These are removed within a few days. There will be a small, external splint on the nose for five to seven days after the surgery. If the septum is altered, internal silastic splints are also used, but the nose will not be packed. After surgery the nose will feel blocked and small amounts of fluid will drain from it. Gauze is used to absorb the fluid and medication is given to limit any pain and nausea. You may usually return home on the day of surgery or you can choose to stay overnight. There will probably be some discomfort on the first day but it is generally not severe and decreases quickly. At home you must set yourself up in a comfortable chair, couch or bed, with your head elevated. On discharge, you will be advised to restrict your diet to liquids initially, but you may eat food as soon as any nausea is resolved. Small amounts of fluid, which may be bloodstained at first, will continue to drain for three days or more. If bleeding occurs after surgery, it may be controlled by sitting quietly with ice packs on your cheeks. If it persists, it may require nasal packing and you should contact my rooms immediately. This is extremely uncommon. 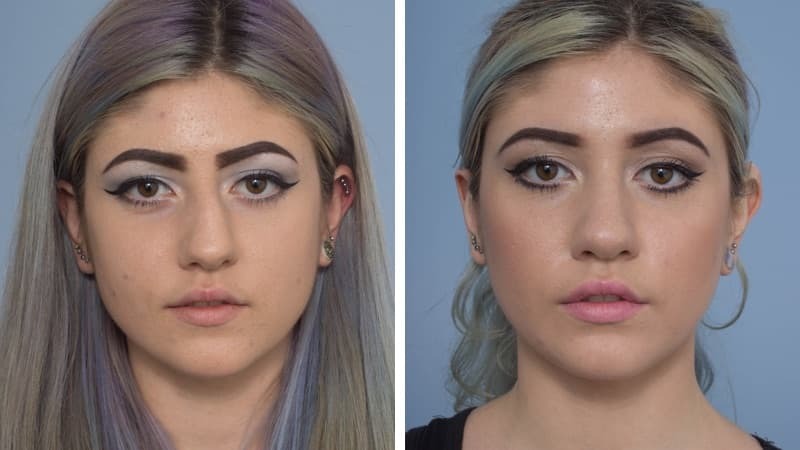 Facial bruising is normal after rhinoplasty. The extent of bruising will vary for each person, but it usually fades within ten days. I recommend two weeks off work depending on your occupation. Heavy exercise should be avoided for three weeks after surgery. Bending, stooping or heavy lifting may cause postoperative bleeding. You may resume driving once you are comfortable, can react quickly if necessary, are not taking strong painkillers and can see normally. This usually takes five to seven days. You will see a noticeable change even through the splint and tapes. After a week or so, when the tapes are removed, there will still be considerable swelling, and your nose may look fat and thick. Try to be patient, as it will take some time before you can see the final result. Parts of your nose will feel numb and it may take several months for normal sensation to return, with the tip taking longer than the rest. 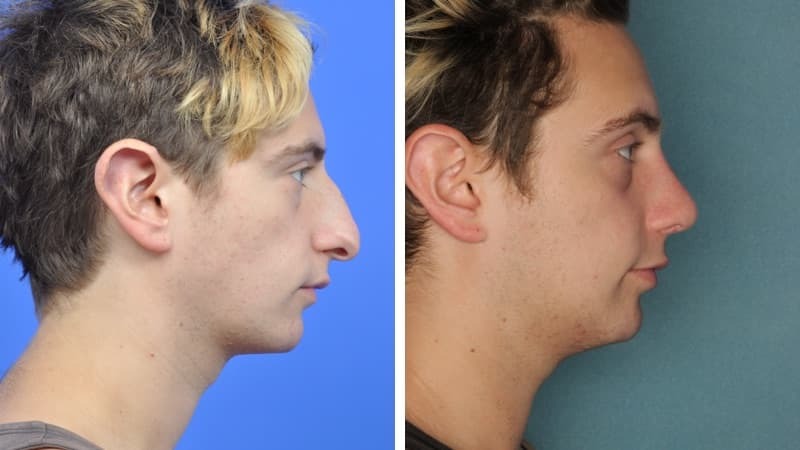 Rhinoplasty in 21 year old male. Major shape change desired, with dorsal remodelling and spreader grafts plus complete tip remodelling. Septo rhinoplasty before and 15 months post. Post nasal trauma with deviation, deformity and nasal airway obstruction.